The drawing of boundaries has always been a key part of the Jewish tradition and has served to maintain a distinctive Jewish identity. At the same time, these boundaries have consistently been subject to negotiation, transgression and contestation. The increasing fragmentation of Judaism into competing claims to membership, from Orthodox adherence to secular identities, has brought striking new dimensions to this complex interplay of boundaries and modes of identity and belonging in contemporary Judaism. 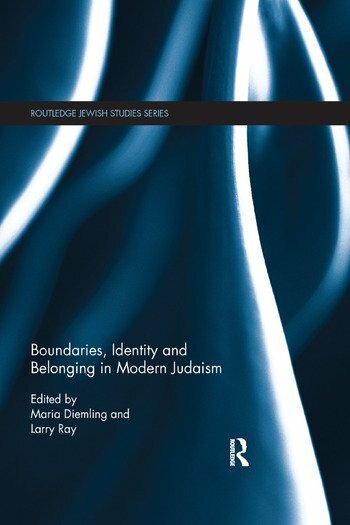 Boundaries, Identity and Belonging in Modern Judaism addresses these new dimensions, bringing together experts in the field to explore the various and fluid modes of expressing and defining Jewish identity in the modern world. Its interdisciplinary scholarship opens new perspectives on the prominent questions challenging scholars in Jewish Studies. Beyond simply being born Jewish, observance of Judaism has become a lifestyle choice and active assertion. Addressing the demographic changes brought by population mobility and ‘marrying out,’ as well as the complex relationships between Israel and the Diaspora, this book reveals how these shifting boundaries play out in a global context, where Orthodoxy meets innovative ways of defining and acquiring Jewish identity. This book is essential reading for students and scholars of Jewish Studies, as well as general Religious Studies and those interested in the sociology of belonging and identities. Maria Diemling is Senior Lecturer in Religious Studies at Canterbury Christ Church University. She has published on early modern Jewish history, Jewish-Christian relations and, more recently, on food as a marker of identity in contemporary Judaism. She is co-editor of The Jewish Body (Brill, 2009). Larry Ray is Professor of Sociology at the University of Kent. He has published on globalization, postcommunism, the sociology of violence and post-Holocaust Jewish identity and memory. Recent publications include Violence and Society (Sage, 2011). He is a Fellow of the Academy of Social Sciences.